Jennie Marinucci '16 presented her research on providing healthcare to the elderly at the URC and in Washington, DC. One UNH senior who is part of this year's Undergraduate Research Conference has also taken her research off campus after being selected for the 20th Annual Posters on the Hill event by the Council on Undergraduate Research (CUR) in Washington, DC. “Posters on the Hill helps raise awareness of the high-quality research undergraduate students undertake, the impact of this research on students’ professional preparation and the importance of continued investment in and expansion of undergraduate research support,” CUR noted in its announcement of Jennie Marinucci’s selection for this year’s event. 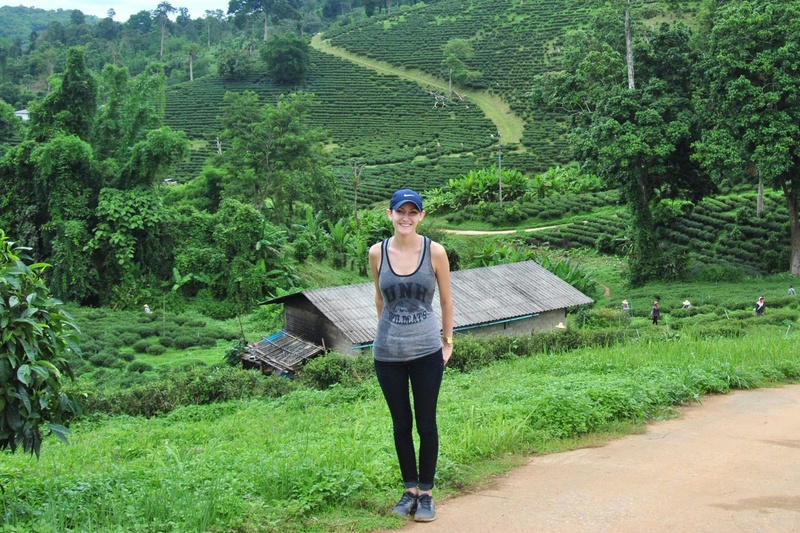 Marinucci traveled to Thailand to conduct her research. Marinucci is one of 60 presenters chosen from about 300 applicants. “While presenting at a forum open to members of Congress as well as many government officials, I also had the opportunity to meet with New Hampshire Sen. Kelly Ayotte to discuss my research,” says the Norwood, Massachusetts native. 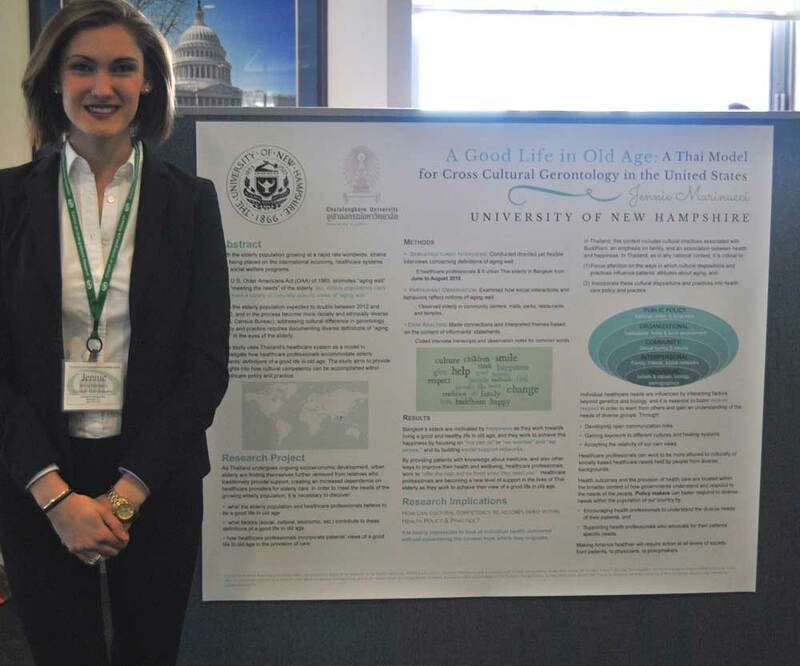 At UNH, Marinucci, who will attend Harvard's School of Dental Medicine in pursuit of a doctorate, researched issues surrounding the delivery of healthcare to the elderly. Biomedical science major Jennie Marinucci '16 is quick to praise those who made her research in Thailand possible. Awaiting her presentation in Washington DC, Marinucci was thinking about her International Research Opportunities Program mentors, Dr. Natalie Porter of the University of Notre Dame and Dr. Chulanee Thianthai of Chulalongkorn University in Bangkok, and feeling grateful for the donors who made her experience possible — Mr. Dana Hamel, Mr. and Mrs. Frank R. Noonan, Dean Ted Kirkpatrick and Ms. Anna Bruning. She says the support of her mentors and donors extends beyond the research itself. “Before, I was just comfortable becoming a doctor, of sorts, and just treating people and moving on — doing art, volunteer work and caring for children and family in my free time. But because of this project and Dr. Porter, I was able to find a way to combine this incredible passion for the field of anthropology, public health, academics and research," she says. "I don’t ever want to stop learning." After she presented her research at the IROP symposium last fall, Marinucci was inspired by the feedback she received. Marinucci recently shared her work in detail for UNH’s Inquiry Journal. From her summer in Thailand to the IROP symposium to this month’s presentation on Capitol Hill and the COLSA URC, Marinucci says it is difficult to put the impact of what she has experienced into words. “My IROP research experience didn’t just define my college experience but also my future career and, more importantly, my passions. I can honestly say now that I am happy with who I am, where I am going and the person I’ve become, all thanks to my experience in Thailand and the incredible opportunities it has led me to,” she says. Jennie shared more about her research at the 25th Annual COLSA Undergraduate Research Conference on Saturday, April 23.